At this time of year, a lot of us are looking back on the resolutions we made for 2016, and either congratulating ourselves for having accomplished them, or beating ourselves up for failing to live up to our own expectations. 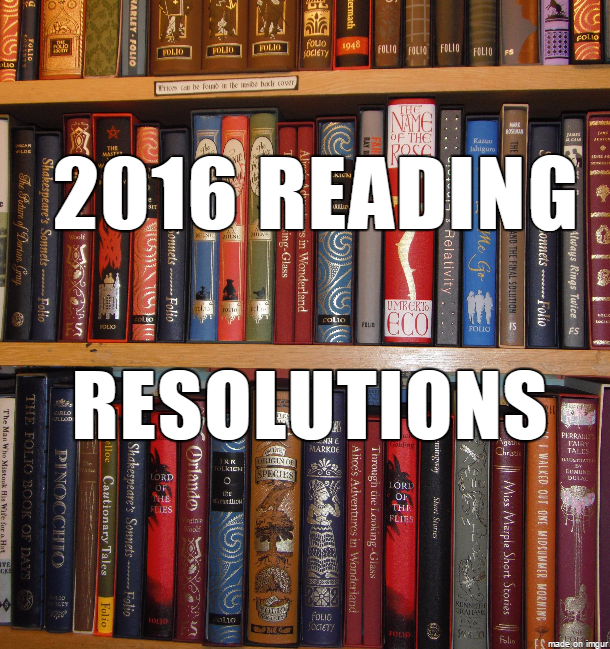 Most of my goals for 2016 were centred around reading, writing and the publishing world. Although I managed to accomplish some of them, my year was derailed pretty early on and I never quite got back on track. 2016 was a really tough year for me and my family, and most of my emotional energy was focused on dealing with losing my granny and supporting my mum through cancer, so my goals fell by the wayside. Normally, I’m the kind of person who is very goal-orientated and doesn’t cope well with failure (even if it’s only self-perceived failure), but, now that the relentless wave of 2016 has finally washed ashore, I’m trying to look at things differently. Rather than being angry with myself for not achieving everything I wanted to, I’m choosing to be proud of myself for making it through 2016 with my sanity, self-confidence and sense of humour intact. I wouldn’t have managed that when I was younger, so I’m counting it as a solid achievement. I’ve signed up to participate in the Goodreads Reading Challenge for the second time. Last year, I set myself a goal of 45 books, which turned out not to be attainable, so this year I’m aiming for 30 books. I have a great stack to get started with and I’m looking forward to delving into them. Last year, I decided to participate in the Modern Mrs. Darcy’s 2016 Reading Challenge to read 12 books in 12 different categories in 12 months. It was a fun idea, but I only managed to read about half of the books on my challenge list (to be honest, I completely forgot about it and just read whatever I felt like). This year, I’m not going to try to stick to a specific list, but rather just aim to read a mix of genres in both fiction and non-fiction. Getting my first short story published last year was a great experience and one I would love to repeat, but my main goal this year is just to write, whether or not I feel like sharing it with others. I didn’t write any fiction at all in 2016, since all my ideas stubbornly refused to make their way from my mind to the page, so I’m hoping to change that this year. There are so many characters running around in my head, a few of them are bound to break free! This blog didn’t get much attention from me last year either, so writing more posts is another goal. The ones that have meant the most to me have been centred around mental health issues, which I’ve been dealing with a lot in the last year. A number of people have told me that those posts have helped them and that they’ve shared them with others, which is fantastic to hear, and it’s given me the confidence to write more along the same lines. Publishing is a dynamic and sociable industry, and I’m keen to get more involved. I’ll be going to the Publishing Scotland Conference in February and the Society of Young Publishers Conference in March, but there are loads of other literary festivals, events and online book chats I want to check out this year. I feel good about these goals and I think they’re realistic and interesting enough for me to achieve, so I’m going to leave it there for now. I hope you all enjoyed bringing in the new year, and I wish you all the best for 2017! I recently read an article about my favourite poet Robert Frost’s poem ‘The Road Not Taken’. The poem is widely regarded as a metaphor for the risks and rewards of taking the road less travelled. However, as letters between Frost and the original recipient of the poem reveal, this was not Frost’s intended meaning. Frost had written the poem to his friend, Edward Thomas, to poke fun at the fact that Thomas always expressed regret at not having taken a different path during their country walks together. To Frost’s annoyance, Thomas missed the point and instead praised Frost for having penned such a “staggering” poem. Frost’s frustration with the misinterpretation of his work is understandable, and something I’ve experienced myself multiple times over the years. However, in time I’ve come to realise that, just because I’ve written something, doesn’t mean my understanding of it is the only valid one. Anything that is created, be it a story, song, painting, or film, means something different depending on who is experiencing it. I may have arranged the words on the page, but who am I to tell readers where those words should take them? That’s the wonderful thing about creative works. They are not static. They do not have a singular meaning. Once a story is released from the author’s mind and written down for others to read, the author loses their creative hold over it. They will always have a material hold by virtue of owning the copyright, however, their ability to dictate how their work should be interpreted vanishes as soon as others read it. Earlier this year, I had a short story published in the Almond Press anthology Apocalypse Chronicles. A number of my friends and family kindly read it, and many of them kept asking me who the character of Tom was based on. I guess it was obvious that Hannah, the protagonist, was loosely based on me, but no one seemed to believe me when I claimed that Tom was not based on any particular person. At best, he is an amalgamation of a number of the boys I went to high school with, but I had no one specific in mind when I wrote his character. Yet, those readers who know me continue to make that assumption. It’s a peculiar fascination that they seem to fixate on. Surely, this character must be based on someone from my own life, especially since I set the story in my hometown. This seems odd to me, since I wouldn’t be much of a storyteller if I couldn’t conjure up characters from my imagination. It is a common belief that a writer reveals more about themselves in their work than they intend (the same can likely be said for artists, filmmakers and musicians), and my readers’ preoccupation with finding out who I had based Tom on made me question whether or not I had, subconsciously, based him on someone after all. (After much thought, I maintain that I didn’t). It used to annoy me when readers interpreted my writing in a different way than I had intended. As if I had somehow failed to express myself well, or they just didn’t “get it”. Now, I find joy in their various interpretations. If people can read what I write and find more than one meaning, then that means I’ve written something that has layers and can be appreciated in a number of different ways. That’s a compliment, not a criticism. I write more for myself than anyone else, so my stories and poems will always have particular meaning to me, as I know what I had in mind when I wrote them. That said, it’s nice to know that they can take on a new life when read by someone else, and can have more meaning than I was able to see for myself. I love to write. I always have. When I was a child, I would scribble endless stories on scrap pieces of paper and staple them together as little books. Inspiration came from all sorts of places. The animals in our garden were sentient creatures that would go on fantastical adventures among the overgrown trees and shrubs. The lovebirds we looked after while my grandparents were on holiday were on their own vacation and would break out of their cage at night to socialise with the wild birds. The ornaments on the shelves would come to life in my imagination and go on all kinds of adventures in the outside world, (my favourite of these was ‘The Pig That Lived in the Wild’ which I illustrated and recorded as an audiobook). Once, I wrote a story about a squirrel that went into outer space in his squirrel-sized spacesuit. I have no idea where that one came from! As I got older, my writing turned inward and rarely ventured beyond the boundaries of my journal pages. Severe depression and crippling OCD inspired poetry and introspective monologues that eventually helped to restore my emotional equilibrium. The mental health centre where I was treated kept some of my writings to help other patients, and ever since then I have believed in the power of creative expression to overcome emotions that would otherwise be suffocating. You can read more about those experiences in one of my previous posts. Years have passed since then and my life is much busier now, to the point that sometimes I don’t realise that I NEED to write. The words force themselves through though, one or two lines at a time, until I have no choice but to notice them. Sometimes, I dream about a dark room with a single spotlight shining on an easel holding a large sheet of white paper. As I watch, words appear on the page written by the invisible hand of my subconscious to form poems or extracts from stories. When I wake up, the words are still vibrant in my memory, and I make sure to write them down before they disappear again. It’s been a stressful start to the year, and I think these words are an expression of how I respond to emotional upheaval by taking refuge in writing. Those are usually the times when the words are at their most insistent and will run riot in my mind until I write them down. I’m not sure where this blog post came from, but recently I’ve been feeling the need to write something, and this is what appeared when I sat down at my laptop. This post is coming a bit later than I wanted, but it’s been a busy start to the year! I’ve been reflecting a lot about the past year and what I want for 2016. My main focus is buying my first house, which is obviously a huge decision and will take up a lot of my time and energy once the ball gets rolling, but I definitely want more reading and writing to be part of this year. I’ve come up with a list of goals that I’m hoping will help motivate me. Maybe some of these will inspire you too, especially my fellow bibliophiles! Goodreads Challenge: I’ve never done this before but I wanted to this year so I could track how many books I read and give myself a target to aim for. I’ve gone with 45, which is approximately 4 books per month. Hopefully I can manage that! I’ve read one so far, Ink and Bone by Rachel Caine, which I’ll be reviewing soon. 2016 Reading Challenge: This year I’m taking part in Modern Mrs. Darcy’s 2016 Reading Challenge, which is to “read 12 books in 12 different categories in 12 months”. I’m looking forward to diversifying my reading and finally tackling some books I should have read years ago. I wrote a post about it here. Writing Competitions: Last year I entered a competition run by Almond Press to write a short story with an apocalyptic theme. I’m delighted that my story was chosen to be published as part of their anthology which will be released later this year. It’s made me feel more confident as a writer and I’m keen to enter more competitions this year. 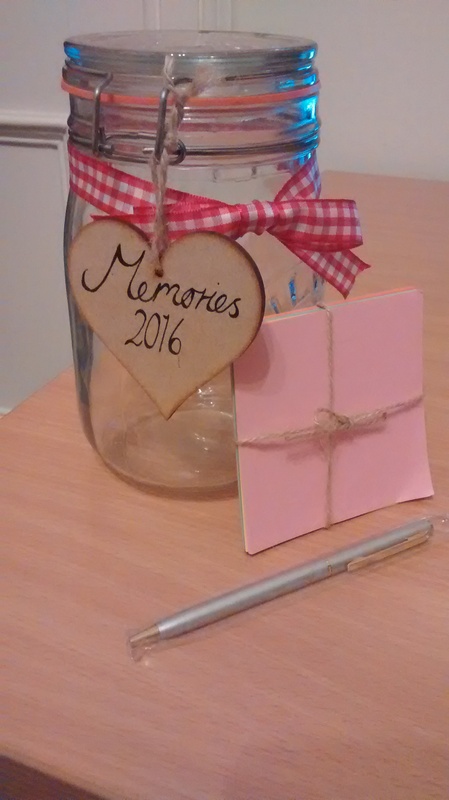 Memory Jar: I’ve wanted to do this for years but have never gotten around to it. I’m a very nostalgic person and love to look back on things past, so having a memory jar where I can keep note of significant events and milestones feels like a great idea. I got mine from Pretty Pink Toes via Amazon. Blog Posts: I don’t post here anywhere near as often as I would like and I want that to change this year. Along with book reviews and general posts, I really want to feature more projects like the Future Library Project that I wrote about in 2014. It was one of my favourite and most popular posts and I love hearing about creative ways of sharing the reading experience, so I would like to share them here too. Literary Events: I already know I’ll be going to a couple of book festivals and publishing conferences this year, but I would also like to attend more events like literary salons, book launches and author events. Writing, Writing, Writing: Above all, I want to write as much as possible. I have a novel idea which is slowly being fleshed out and I would love to do some solid work on it this year. I’m never happier than when I’m writing, so I want it to be a constant theme of 2016. I hope you’re all having a great start to the year and that it will be a good one! I came across this postcard in a stack I had bought months ago. 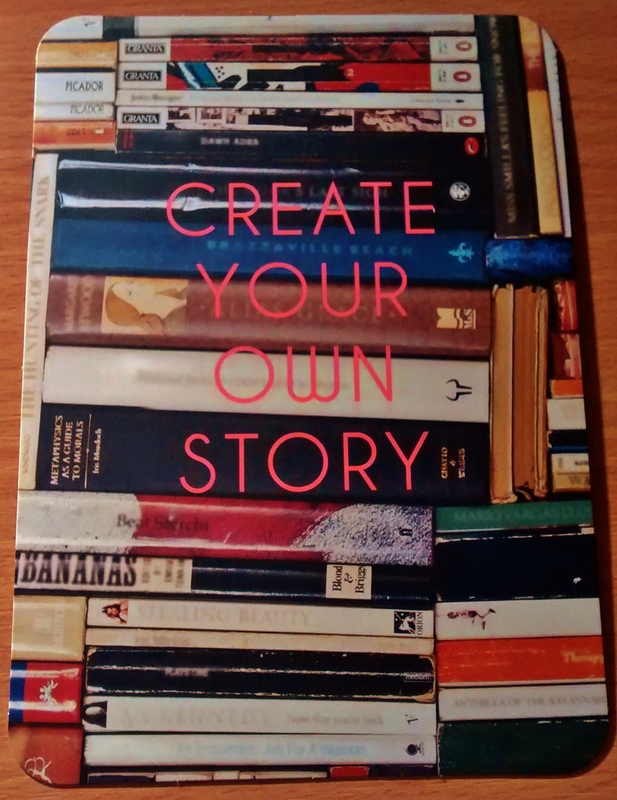 While I was writing it to send to a friend I found myself thinking about the meaning behind the words CREATE YOUR OWN STORY. You could take them in the literal sense. They could serve as inspiration for finally writing that novel or short story you’ve been nurturing the idea for, but have kept hidden away for months, maybe even years (I have a whole file on my computer for those). Or you could take them another way. Maybe something like this. Sometimes, you’re not sure of yourself. You wonder where your life is going and where you’ll be a month from now, a year from now, a decade from now. You worry you’ll still be exactly where you are right now: stuck, like an insect caught in amber, unable to move while you watch the world revolve around you. You doubt the choices you have made and the roads you have walked down. You wonder if you are doing enough each day to reach your goals and take yourself closer to your own idea of what happiness is. In the world we live in now it is easy to forget that life is not a literature class. You are not required to compare your story to others and analyse themes, images and metaphors to draw a conclusion of which one is more effective or more meaningful. You have always been told never to judge a book by its cover, yet you do it every time you judge yourself and others by appearances alone. You shouldn’t, you know. As you get older, your cover will get worn. The colours will fade and creases will appear. When you look back on that life and approach its epilogue, I promise that you will care more about the pages you took the time to write and live in than the futile efforts you made to make that cover look perfect. Besides, covers rarely tell us what a story is really about. Walking into a bookshop or a library you will find that no one story is the same as another. Many are similar, but none are identical. The same is true of you and those you compare yourself to. Your life has its own story arc with different chapters in a different order. It has its own cover, its own format, its own style. Embrace it. Accept it. Stop comparing your story to others and just focus on writing it in the way that makes sense to you. You will be far happier that way; I guarantee it. One more thing. Don’t forget to share your story with others from time to time, even if you think they won’t be interested. You never know, to them, you might be a Classic or a bestseller. A story they will never tire of reading. I’m not sure if this will mean anything to anyone or if it even makes sense. It doesn’t really matter. I wrote it for myself and the people I care about* who I know feel this way and I wanted to share it. Thank you for reading this small part of my story. *To the friends of mine who read this, please know that to me you are Classics and bestsellers and I will never get tired of hearing your stories or sharing mine with you.